Asters burst forth in chromatic tones as the gardening year reaches its peak. They alone have the flower power to bring strong flushes of colour before winter's cover. Autumn Aster’s have had a tough time. Since their popularity peak, at the turn of the 19th century, their use has stagnated. Back then every respectable autumn border, boasted blocks of autumn asters with teams of gardeners battling against their propensity to flop and to turn ugly with mildew. Asters gaineda reputation of being “too difficult” and lots of work. More recently they have been confused with chrysanthemums and stamped with the deathly stigma of a “cemetery flower”. Manipulated with growth-stunting chemicals and forced to flower on cue, with light-then-darkness treatment, autumn asters are sold as colour daubs for graves in autumn. Driven by the colour potential of autumn asters, professional gardeners in England, Germany and Switzerland have been working quietly in the background for decades, improving and hybridising new disease resistant varieties. There are now asters that will bloom profusely as early as July and others that will keep it up until November. Chosen in Europe as “Perennial of the Year 2002”, autumn asters will orchestrate a spectacular flowering finale when all other plants are pulling in their horns. Ironically for asters their end-of-year flowering advantage is their disadvantage. When garden lovers visit nurseries in spring, asters are insignificant, and when they visit in August most autumn asters are just coming into bud. Professional nurseries know that plants must be in flower to sell. Their brilliant colour spectrum, their variety of petal and flower form are lost on potential buyers. Without seeing few will buy. Aster novi-belgii the is indisputable colour star. 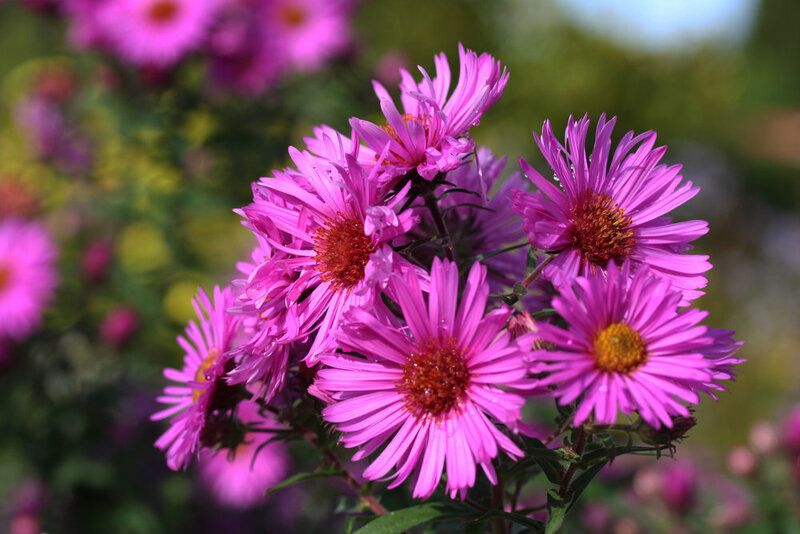 This tall-growing autumn American native (named when New York was called New Belgium) has the broadest colour palette of all aster varieties. Smooth leaved A. novi-belgii is a boon for blue flower lovers with an unparalleled range of blue hues. It can also appease those preferring pink. Aster novi-belgii and its American-native relation Aster novae-angliae (the New England Aster with hairy leaves) have a range of pale to shocking (pink) and heavenly purples and reds. Experts are emphatic about keeping choices simple. Select a colour direction, blue or pink and start with three varieties each with a staggered flowering time. The golden rule is to plant quantity. The dramatic mass flowering effect, particular to this genus, is achieved only by numbers. Too often Asters are treated like solitaire plants with predictably disappointing results. Single stemmed specimens find few lovers. Great autumn aster fans are insects and butterflies. The indigenous varieties of Asters, the Aster amellus (named after the Italian river “Mella”) and the small compact Aster dumosus are for some species of insect, the only source of nectar in difficult pre-winter months. One of Aster’s hybridising greats from last century, the German Karl Foerster poetically remarked, ‘without Asters the subtle tones of autumn’s song are lost. Asters embody the spirit of autumn’. Autumn asters alone bring the last explosions of vibrant life before winter’s blanket spreads closing the gardening year.